Williams-Sonoma’s culinary legacy began in 1956 when Chuck Williams opened his original cookware shop in Northern California. Since then, Williams-Sonoma has become a global kitchenware brand, with more than 250 stores in the U.S., Canada, and beyond. 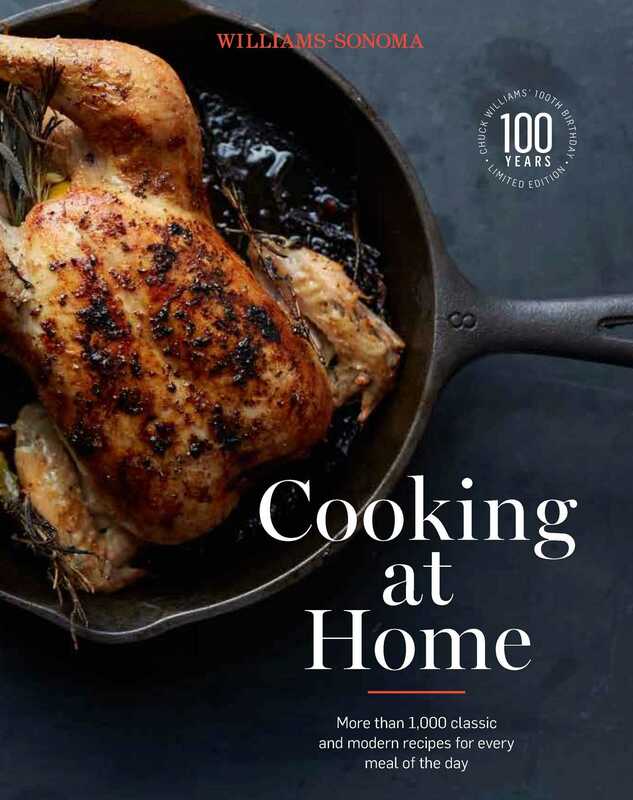 Re-released in celebration of Chuck Williams’ 100th birthday, Cooking at Home features over 1000 recipes from the Williams-Sonoma publishing program, which Chuck guided. In addition, the book includes 100 recipes from Chuck’s personal recipe collection. For nearly 60 years, Williams-Sonoma has connected and inspired home cooks with the best cooking equipment and kitchen-tested recipes. Cooking At Home celebrates that legacy with recipes culled from its award-winning publishing program, which was guided by Chuck Williams for more than 2 decades. More than just a recipe collection, the book features a wealth of informative tips, techniques, and cooking know-how. The book’s 22 chapters cover cooking topics from A-Z, making it a complete cooking reference book you can use every day, whatever you are in the mood for and whatever the occasion.Throughout this newly updated edition, you’ll find stunning photographs and special stories that highlight 100 of Chuck Williams’ personal recipes. New recipes include: quiche lorraine, deviled crab, fettucine with prosciutto and peas, poached salmon, curried shrimp with rice, meat loaf, braised endive, potato and onion gratin, giner-apple crisp, simple chocolate truffles and more! Be sure to check out “Chuck’s Finds,” which highlight special merchandise that Chuck introduced in his Williams-Sonoma stores to the U.S. public. Bring a large pot three-fourths full of water to a rolling boil over high heat. Meanwhile, in a large sauté pan over medium-low heat, melt the butter. Add the onion and sauté until translucent, about 5 minutes. Add the prosciutto and cream and simmer, stirring, for 3–4 minutes longer. Season with salt, remove from the heat, and keep warm. Add 1tablespoon salt, the peas, and the pasta to the boiling water. (If using dried pasta, add the peas when the pasta is almost done.) Stir a few times to separate the pasta and keep it from sticking to the bottom of the pot. Cook, stirring once or twice, until al dente, about 2 minutes for fresh pasta or 8–10 minutes for dried, or according to the package directions. Just before the pasta is ready, return the sauté pan to high heat. Drain the pasta, add it to the sauté pan, and toss briefly until well blended with the sauce. Transfer to a warmed serving bowl or individual plates and serve right away. Pass the Parmesan cheese at the table.